If you regularly test your blood glucose as part of a diabetes management plan, it's important that your blood glucose test strips give you reliable and accurate readings. 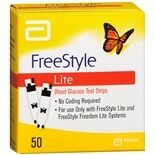 You'll find glucose test strips that can be used with various meters from brands Nova, Bayer and FreeStyle. 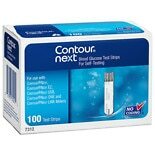 To meet your needs whether you test weekly, daily, or multiple times a day, test strips are available in 25-, 50- or 100-packs. 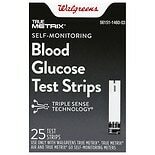 Be sure to buy the brand or brands of glucose test strips your diabetic meter requires. 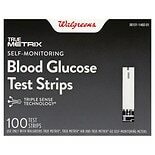 There are some test strips that are only compatible with the same brand and a specific model of glucose monitor. 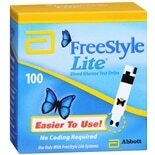 Some features of glucose test strips help make testing almost effortless. 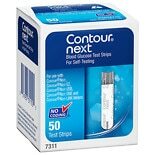 Test strips that don't require coding can be simpler and quicker to use. 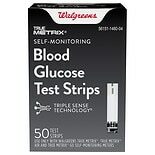 Blood glucose test strips with absorbent tips and a comfortable size can be easier to handle. Maintain a healthy lifestyle with diabetic supplies to help you manage your blood glucose. 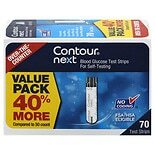 In addition to blood glucose test strips, there are many blood glucose meters and diabetic lancets to choose from that offer features to simplify testing. We carry diabetic nutrition supplements and foot care products to help with daily living. Find protein supplements, calorie supplements and shakes that can satisfy cravings and help you avoid a blood sugar spike. There are even diabetic vitamins to help support your overall health. To care for your feet, try diabetic foot creams that can improve circulation and diabetic socks to help alleviate leg fatigue.